Antibody dextran conjugates consists of multiple copies of antibody covalently linked to high molecular weight dextran, creating a highly multivalent antibody construct. These constructs serve to crosslink receptors, which are the antibody target, on cell surfaces. Crosslinking membrane IgD on B cells with unconjugated anti-IgD antibody induces B cell proliferation at µg/ml concentrations. By contrast, anti-IgD dextran induces vigorous B cell proliferation at ng/ml. 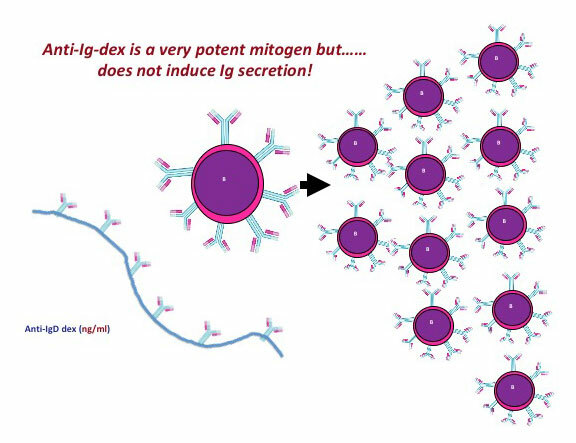 Furthermore, in contrast to unconjugated anti-IgD, anti-IgD-dex-activated B cells undergo substantial Ig class switching and differentiation into Ig-secreting cells in the presence of various second signals, including cytokines and Toll-like receptor ligands. Thus, Anti-IgD-dex is an efficient and potent polyclonal B cell activator for studying a wide range of B cell functions. 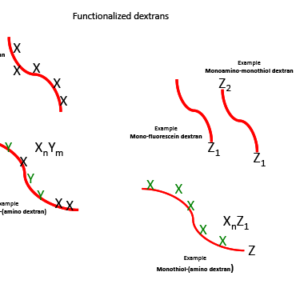 Fina Biosolutions provides anti-IgD and anti-IgM dextran conjugates, targeting mouse and human. 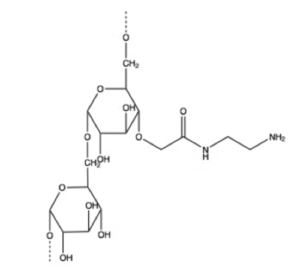 Streptavidin-dextran can be used to prepare multivalent polymer conjugates using a biotinylated species (i.e., antibody, TCR, antigen, etc.) Fina Biosolutions’ standard streptavidin-dextran is synthesized from 2000kDa amino dextran and contains 30-40 Streptavidin per polymer. Please inquire about Streptavidin conjugates based on other molecular weight dextrans. All antibody dextran conjugates are stored at -°80C and are shipped on dry ice.